9:00: It’s taken us a full day, two kilos of oversalted shellfish, and a trough of caipirinhas, but we have finally recovered from the 36-hour trip from Stockholm to Rio (via Berlin, Zurich and Sao Paulo). We are in Rio de Janeiro (‘River of January’), a glittering city of around 6 million which funnily enough does not have a river but a gigantic bay and many beaches. At breakfast, we watch impossibly toned and tanned beautiful people do yoga and practice a form of soccer-volleyball, all apparently without any hint of irony whatsoever. Afterwards, we meet our guide, Leonardo, who promptly learns that we will go anywhere and do anything, as long as we are fed well for our trouble. 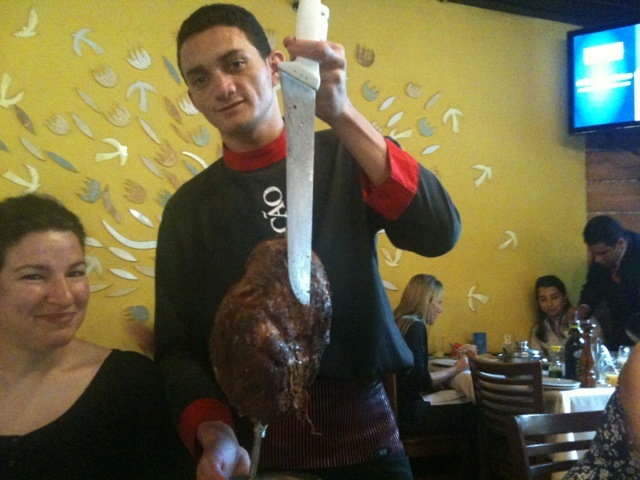 He pledges to take us to Porcao, one of Rio’s best-known churrascaria rodizios (barbecue houses), as soon as he can. 13:00: Thanks to a crowd of especially exuberant Koreans and a traveling samba band (“Now is the time for the samba,” says Leonardo, who cannot stand the samba) the tram trip up to Christ was amusing, but we are now in a post-giggle funk after being confronted with a snarl of traffic that just might rival the best Bangkok has to offer. Although Leonardo claims it is a bit early to stuff our faces, we are famished, and head to the nearest Porcao (Av Infante Dom Henrique, (021) 3461-9020) we can find. At Porcao (which, as @SpecialKRB points out, is pronounced “poor cow”), we find cuts of every part of the animal awaiting us including the rubbery hump (called cupim), plus a generously-proportioned buffet of “sushi”, salads and hot stews that we ignore until we are almost full. Luckily, I am wearing a maternity dress chosen especially for the occasion. After stuffing ourselves to near-bursting, we promise to never, ever eat ever ever again. 9:00: We break our promise at breakfast the next day, when I once again inhale an entire plate of cold cuts and cheese with plenty of bread, as I am told is the breakfast of choice for true cariocas (natives of Rio, which loosely translated in the local language actually means “house of the foreigner” or “house of the white man”. Go figure). This is especially interesting since it is very hard to find starches like this for lunch or dinner unless you actively ask for it. Is this the “Rio diet”? Only enough carbs to keep you regular and then not touching them after noon? Eating manioc like a maniac at ridiculous times of the day, like 3pm and 11pm? Will I lose a bunch of weight and write a diet book and become a famous weight-loss guru like Rocco DiSpirito? Only time will tell. Nevertheless, we manage to hold off until 3pm, when Leonardo takes us to Urca, a neighborhood known for being exclusive and inhabited by members of the military. 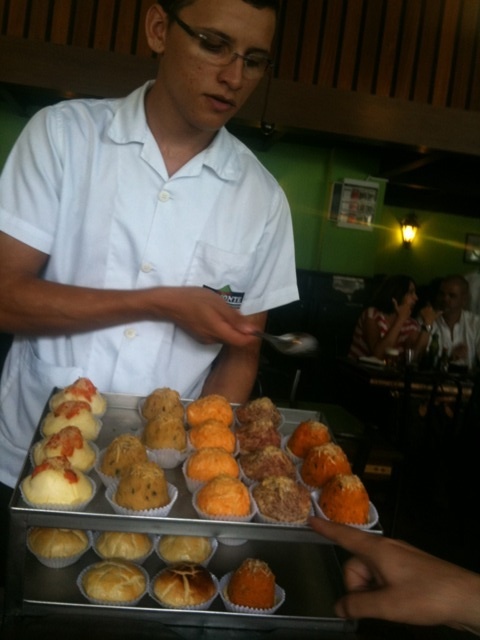 Here, we get our first taste of some delicious Brazilian snacks: bolinhos, coated in crumbs and deep-fried; pastels, wrapped in pastry like pierogies; and empadas, fillings set atop pastry (“open”) or enclosed completely (“closed”). 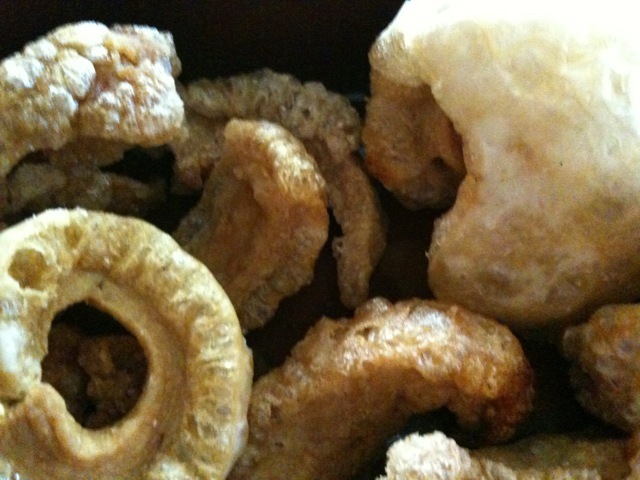 These are all washed down with a glass of light draft beer (chopp) and can be found at any boteca or botequim. 18:00: After another long day, we finally make our way to Academia da Cachaca (26 Rua Conde de Bernadotte Leblon, (021) 2529-2680), where a treasure trove of cachacas (sugarcane liquor) sourced from all points of Brazil awaits. We select several “doses” of this liquor, the names of which will remain locked in an alcohol-induced haze forever, and they all taste of either cloves, allspice, cinnamon, or caramel. We also order acaraje — a sort of kibbee-like deep-fried “football” of beans, accompanied by a fish stew and a “relish” of coriander, spring onion and dried shrimp — and a sun-dried beef escondidinho, which @SpecialKRB describes as a “shepherd’s pie filled with corned beef hash”. But our waiter draws the line when we try to get a feijoada completa (bean stew with all the fixings), simply refusing to let us order it. Leonardo agrees (“I am afraid you will DIIIIEEEE. You will simply drop dead”) and seems to think a waiter telling us we have ordered too much is an unusual occurrence. Everyone seems to think that, despite the late hour, we will eat dinner after this (“This is lunch,” says Leonardo with a straight face). 22:00: This is the thing. 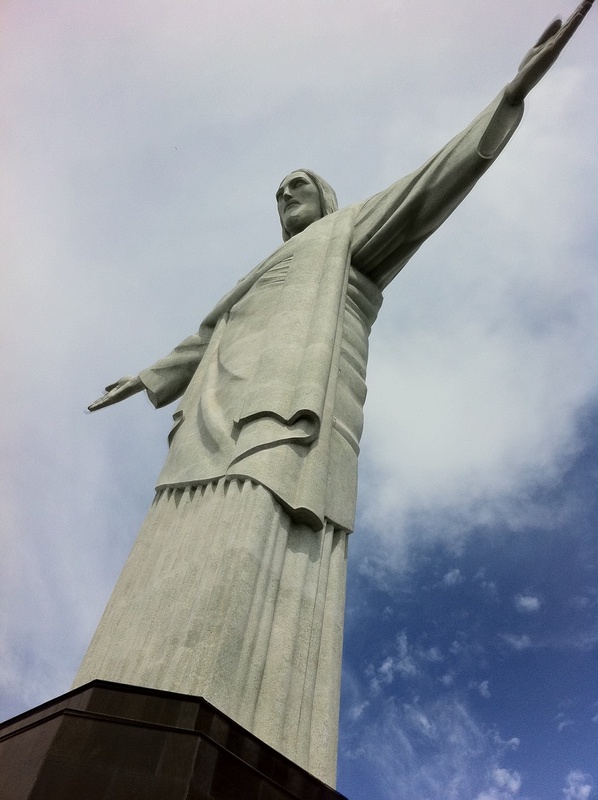 I love Rio in many ways: its laid-back, freewheeling optimism, its sunny weather, its easy-going and friendly people. But so much of it is the complete opposite of the doddering oldie I am today. Despite exhortations from every Brazilian we know to explore Rio’s vaunted nightlife — (“Don’t go there until 3am. You will find NOBODY,” Leonardo advises as we pass one famous nightspot. “This club is after-hours. You can go there at 6am.” He says later of another. “Come on,” he finally tells us when confronted with our ashamed, vaguely defiant faces. “Don’t be different”) — we cannot find the strength to stay awake. Leonardo is talking to the squarest, most boring people in the world. 13:00: Leonardo-less today, we finally make it to Casa da Feijoada (Rua Prudente de Moraes 10, (021) 2523-4994) where we get our black bean stew accompanied by braised pig tails, ears and trotters, rice, deep-fried pork rinds, fried collard greens, fried manioc, farofa (roasted cassava flour) and orange slices to cut the fattiness. We get both passionfruit and lime batidas (cachaca with fruit juice and ice) and a bottle of wine. This renders us comatose for the rest of the day. Finally sated, we stumble outside into the bright sunlight, spot vultures circling overhead and consider the beach for the rest of the day. I have not lost weight on this diet by any stretch of the imagination. Busting a gut in spirit. LOVE Brazilian food! 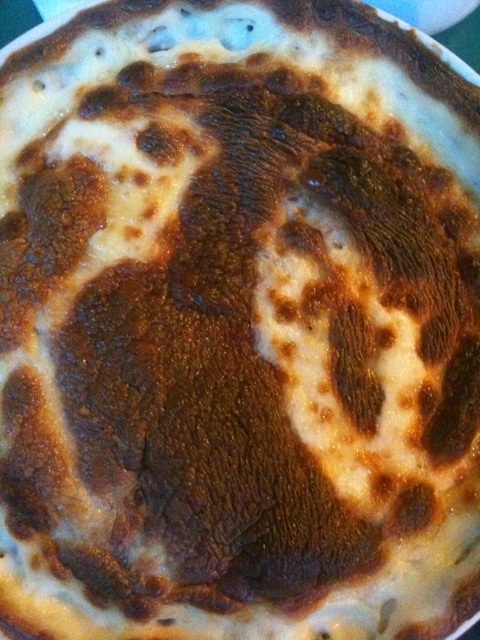 Looks like you got your meat quotient in for awhile…. Need a meat AND liquor break! Not sure if it’s for 15 minutes or for 15 days tho. 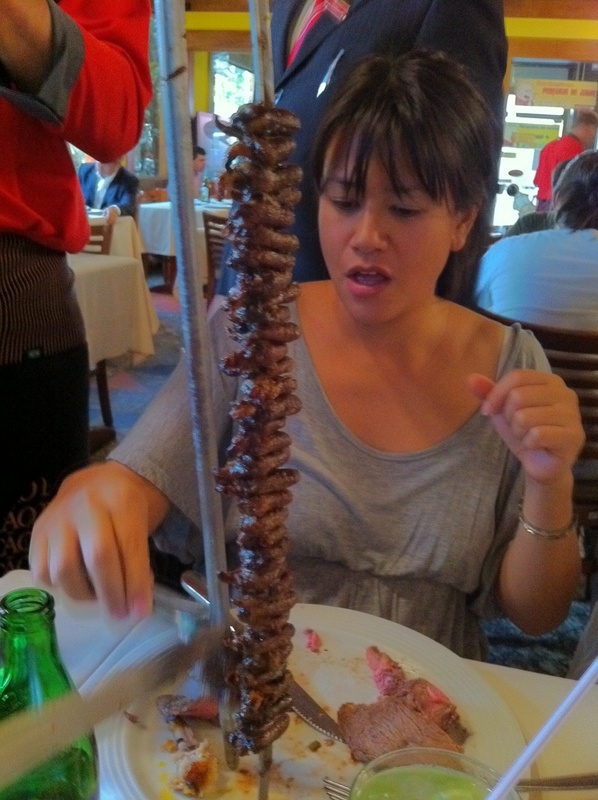 This post, and our steady intake of meat products and caipirinhas, made me bust a gut. Fahn-TAH-stick! Next time we need to focus on the street food too. Our time in Rio was fahn-TAH-stik. I miss Leonardo. Wow, sounds like an amazing place to visit if for no other reason than the food. There are actually so many great reasons to visit, and I’m sorry I didn’t do them justice, but it would have been 10,000 words! Hanging 10 cm from death on a 100-year-old street car in Santa Teresa; the stunning stairs in Lapa; great views from Sugarloaf; the super-duper Ipanema beach…I could go on.